Stereographic projection. 16"x21" and 23"x30". 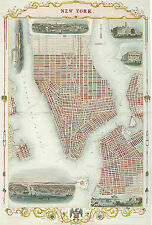 This is a reproduction of the original map. Map shows political boundaries, major cities, vignettes representing various agricultural products, industry and mineral resources. Published by Penn Prints New York. Colors are very vivid and prints are in beautiful condition with only slight wear on edges of paper. Map of Asia, by the Blaeu Family 1662. Views of Brooklyn, New York from Williamsburg and the Narrows from Fort Hamilton. 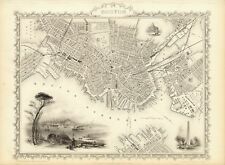 1850 Map of New York. This is a reproduction of the original map. Map Size: 11"x16". Wrinkles at the edges, light fold lines on the map. otherwise a very clean map with lovely illustrations. 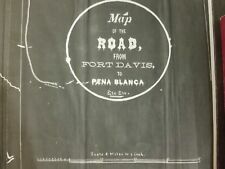 Military map from 1879 reproduced from the National Archives (appears to be print from microfiche). Good - rolled and folded - heavily creased with small tear on one sheet - NOT laminated. Antique Replica The country of Scotland Map 1610 by John Speed 19.5"x 14 3/4"
Great Collectible Latin World Map Nova Totius Terrarum Geographica Colored Antique Reproduction Map By Hoffman La Roche c.1940’s-1950’s. -Marked in LL “Series M6-Hoffman La Roche Inc., Nutley 10, NJ. 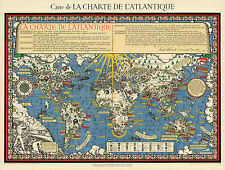 Great Collectible Latin “A New And Accvrat Map Of The World” Colored Antique Reproduction By Hoffman La Roche c.1940’s-1950’s. -Marked in LL “Series M1-Hoffman La Roche Inc., Nutley 10, NJ. 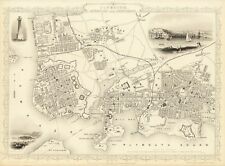 -Marked LR “Overton London 1670” in print. Marked in LL “Series M4-Hoffman La Roche Inc., Nutley 10, NJ.”. -Size 14” W x 18” L.
Vintage 1662 Reproduction Map of ARABIA Denmark BALLERMANN & SON Framed 25"x19"
Printed in Denmark by Ballermann & Sons. The print is in good condition with no issues noticed. Only item pictured is included. Chart of the Sandwich Islands. Offset, hand colored. First map of Hawaii. 19 3/8" x 14 3/8". There will be no exceptions. Great Collectible Latin Britannia World Map Colored Antique Reproduction By Hoffman La Roche c.1940’s-1950’s. -Marked in LL “Series M1-Hoffman La Roche Inc., Nutley 10, NJ. -Latin language. Great Collectible Latin World Map Colored Antique Reproduction By Hoffman La Roche c.1940’s-1950’s. -Marked in LL “Series M5-Hoffman La Roche Inc., Nutley 10, NJ. -Marked LR “Dauckasiss 1690” in print. I have a set of Huffman la roche maps. M1 has Overton, London 1670 M2 M4 has Mercator Amsterdam 1610 M5 has dauckasiss 1690 M6 M7 All from nutlety 10 nj In great condition. Never been unrolled. Box has some damage from the rubber bands deteriorated There’s a note enclosed dated 1958 Very rare to have the whole set!! 1884 Lithograph made in Milwaukee. Here's a Saxton's Map of Kent Surrey Sussex and Middlesex, 1575. Alexis Jaillot's. Alexis Hubert Jaillot's. 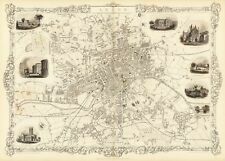 This reproduction Antique Map features Reproduction Map. Victorian Edwardian Dress Design Fashion Colour Prints (#190299330103) £0.99 View Item. 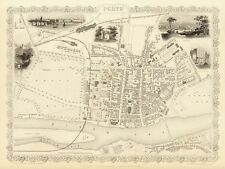 This beautiful reproduction map can be yours for a fraction of the price of an original! Blaeu & Goos. See below. 2 Decorative. 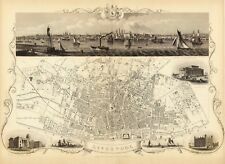 Two Reproduction Antique Map Prints. The first Antique Map features The second Repro Antique Map is A beautifully coloured double hemisphere map of the world with California shown as an island. 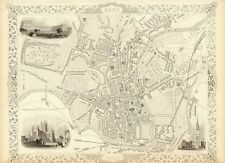 This map is a reproduction of a Town map of Canterbury Kent. CANTERBURY TOWN MAP CANVAS REPRODUCTION. 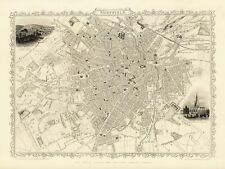 This map has signs of ageing and other marks associated with its age and adds to the overall appearance of the map.